Business Process Outsourcing (BPO) is one of the fastest growing industries in the world. In the Philippines, it is an emerging industry. BPO controlled $9 billion in 2010 contributing 5% of GDP. At present, there are now more than 600,000 staff employed in the BPO sector, and the figures are estimated to go even higher in the coming months. Unfortunately there are just some customer service representatives who don't take their job seriously. 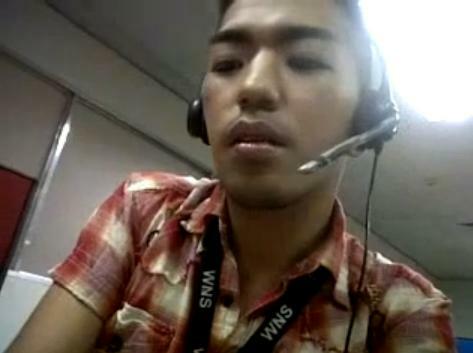 DISCLAIMER: This video don’t﻿ reflect the majority of Filipino call center agents. Most of them are honorable and responsible customer service representatives. The guy on the video was the one who uploaded his own video on his Facebook account last December 16, 2011. That made him liable because the video is accessible to the public. Based on the video, he’s playing the security question of the client which is a serious offense according to some call center agents. These are some of the negative comments gained from this video. Having more than 24k views and 970 likes. There are some who requested to delete the video on Youtube but it’s too late, for sure, everyone has their own copies already.